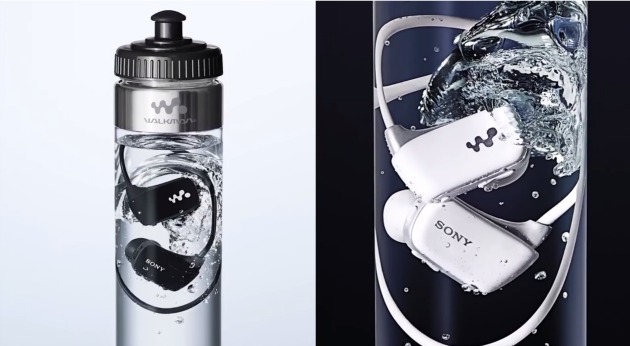 Sony Sells Its Walkman Inside A Water Bottle | OhGizmo! The Sony Walkman NWZ-W270 has been on the market for a while now, but this particular marketing strategy is brand new. Auckland, New Zealand based ad agency DraftFCB was asked by the Japanese giant to help it market the device in the country. To do so, they came up with Bottled Walkman, which simply puts the Walkman in an actual bottle of water and inside a vending machine. They’re selling it at gyms and swimming pools, places where the target demographic is likely to hang out. The visual impact of seeing the Walkman in water sort of drives the point home, though we’re left wondering if anyone is going to actually drink that water after they buy it.